This program will allow you to write the code allowing you to define the quality of the code, and optionally encrypt the output requiring the recipient to enter a password to decrypt it. It’s advised to consult the program’s help files for more information about the quality settings. 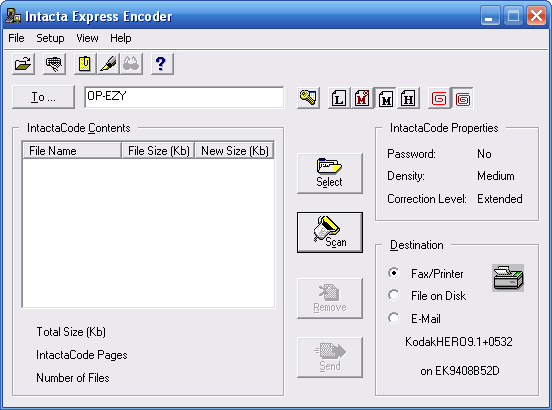 Code generated by this program can be decoded with either the decoder module included, or with the standalone Intacta Color Scan & Fax Read program. 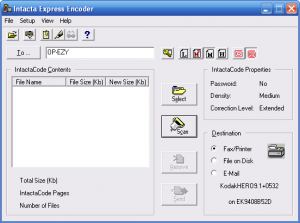 This program will accept code in the forms of either a BMP file, paper (from a TWAIN Scanner) or a Fax machine/modem. The decoded files are shown in the program where you’re able to save them to disk. 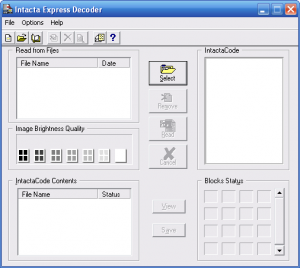 Note, Intacta Express will refuse to install on a 64-bit system due to the 16-bit installer used. Please download this setup launcher to install on 64-bit systems. If you’re installing this on Windows Vista or higher, you’ll find the help function doesn’t work, please refer to Microsoft’s Knowledge Base article (KB917607) to download the appropriate version of WinHlp32 for your system.